I should admit straightaway that my young daughters never actually asked me to build them a tree house. I came up with the idea myself, got them attached to it, and then pretended that my efforts were strictly for their benefit. But Hannah and Caroline’s spontaneous enthusiasm provided the necessary cover for me to do what every grown man secretly wants to do: construct an arboreal retreat, far from unpaid bills and truck repairs, hassles and compromises, uncertainty about the future, inescapable news of loss and grief. Never mind a long weekend in the mountains or going to a ball game. What I really needed was to climb up into a tree house and pull the rope ladder up behind me. The problem with building a tree house in the Great Basin is that we have no trees—not many, anyhow, and fewer still that provide tolerable supports for construction. Because the Ranting Hill sits at almost 6,000 feet, we’re high enough to have Utah junipers here, but they’re tangled, tight, scratchy trees that aren’t inviting for inhabitation. As a result, the girls and I devised a plan to build a platform house that would stand on stilts in the midst of a dense grove of junipers. Construction began only once I had persuaded the kids that a platform house in the trees does officially count as a real tree house. Because my main goal was to make the thing so tall that it would produce an exhilarating feeling of being in the treetops, I chose for my main structural timbers four 16-foot 4x6s, which I set in concrete. This would not only produce inspiring height, but also allow a design featuring both a lower and upper platform, making the structure resemble a desert giant’s bunk bed. Next came horizontal 2x6 supports, then 2x4 cross ribbing, and finally the two floors themselves, each consisting of a full 4x8 sheet of plywood. 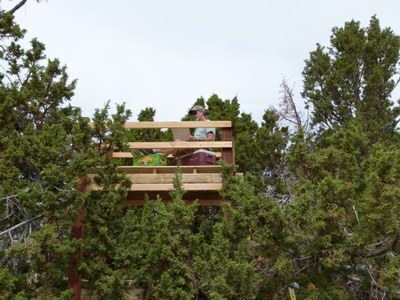 After adding an upper safety railing and buccaneer-style swinging rope ladder the structure was complete: a 13-foot-tall, two-story, 64-square-foot platform house nestled into a thick, aromatic grove of juniper. There’s no point in pretending that my desire to build a tree house wasn’t driven by nostalgia. It all began with the 1960 Disney film The Swiss Family Robinson, based on Johann David Wyss’s 1812 novel by the same title. As a kid I loved that movie, which fueled the fantasy that I could not only escape school but even leave the earth, clambering up into a labyrinthine treetop hideaway from which no grownup could make me descend—not even to wash up for dinner. And I wasn’t alone. The popularity of that crappy movie bankrolled the “Swiss Family Treehouse” replicas that popped up at Disney parks not only in Southern California but Paris and Tokyo as well. So popular was this simulacrum of the movie’s elaborate tree house that the Anaheim version lasted from 1962 until 1999, when it was converted into “Tarzan’s Treehouse” as a tie-in with the Disney Tarzan film released that year. And I suspect that the big screen Swiss Family Robinson was itself influenced by the immensely profitable Tarzan film franchise that began in the early 1930s. Let’s face it, any kind of tree house movie provides a damned practical way to separate a guy from his money. The contemporary version of this fantasy—and the immense profit it can generate—is apparent in the passion the ultra-rich have recently developed for tree houses. This opulent fad has gained so much traction in the past few years that there are now more than 30 luxury tree house design and construction firms in the UK and US alone, and most of the tree houses they’re building are not only nicer but also larger than the actual houses most of us live in. Who, you might ask, would be so crazy as to pay six figures for a freaking tree house? The answer is simple: any guy with a ton of scratch who saw The Swiss Family Robinson when he was eight years old. This bizarre indulgence has led inevitably to Finca Bellavista, an upscale tree house development, built high in the jungle canopy of Costa Rica. And just this spring the Animal Planet network launched a reality TV show called Treehouse Masters, in which tree house guru Pete Nelson exposes us to pornographically lavish tree houses while simultaneously trying to persuade us that a tree house with running water, air conditioning, stained glass windows, and a martini bar qualifies as a minimalist pastoral retreat enabling a Thoreauvian reconnection with nature. Reality TV? But while Nelson’s claim is patent horseshit, it is nevertheless irresistible horseshit of the kind few of us could live a single day without. It is obvious that tree houses are meant for kids, and that the adult longing for one is nothing more than an immature expression of a desperate desire to momentarily escape the pressures of adult responsibility. To which I reply: Exactly! That’s what makes a tree house so cool, even and especially after one grows to manhood, realizes that The Swiss Family Robinson is total crap, and then wants to watch it anyway. Believe it or not, there’s precedent for the luxury tree house craze. Some sixteenth-century Italian aristocrats constructed tree retreats in their elaborate gardens—you know, just to get away from the pressures of the main mansion. In some other cultures tree houses have more practical uses. The Korowai, a Papuan people of southeastern Irian Jaya, live in virtually unassailable tree houses over 100 feet up; this is a precaution they take against their neighbors, the Citak, who are reputed to be head hunters. There’s even some argument that a desire to inhabit trees is wound into the double helixes that precondition human behavior. Roughly six million years ago we hominids parted ways from the evolutionary ancestor we share with chimpanzees and bonobos, but there could still be a little deep muscle memory at play here. After all, we share more than 95 percent of our DNA with chimps—and nearly the same amount with bonobos, the central African dwarf chimpanzees whose DNA is closer to human DNA than it is to the DNA of gorillas. To judge by Caroline, our six-year-old, the human-chimp genetic convergence appears to be closer to 99.99 percent. Is it possible that there’s just something in us that wants to climb trees—and, once up there, also wants to build a nest, skip school, and hang out while peeling bananas or mixing martinis? There’s one other cultural context in which tree houses have figured prominently, and that is the amazing tree sitting protests that have been used primarily to save old growth forests from logging, but have also been deployed to protest mining, protect native property rights, and preserve urban green space. A daring variation on civil rights-era sit ins, protest tree sits began in New Zealand in the late 1970s but spread to Australia, Tasmania, Canada, and the US, where they have occurred in California, Oregon, Washington, and West Virginia (to protest and delay mountaintop removal coal mining). One urban tree sit in Berkeley lasted 21 months, and even the mainstream media covered the protest of Humboldt County activist Julia “Butterfly” Hill, who spent a remarkable 738 consecutive days in a 1,500-year old coast redwood from 1997 to 1999. Once in the trees, activists not only build tree houses—where they live for weeks, months, or even years—but also connect those houses from tree to tree, creating a webbed network of cables and rappel lines throughout the canopy. One anti-logging tree village in Willamette National Forest had over 1,000 activists in the trees at various times, and included such practical amenities as composting toilets, hydroponic sprout farms, and lock-on points for activists to chain themselves to during forced evictions. And there’s an especially inspiring tree sit protest being performed this very moment by Sanjay, a man from the village of Baragon, near Varanasi, India, who came home one day to find his wife in the sack with his neighbor. Sanjay immediately shinnied into the crown of a guava tree, where he has remained for the past nine months, refusing to descend until his wife apologizes. Although this report comes courtesy of the UK’s Daily Mail tabloid—which also broke the story that a crack in the sea floor will drain the Atlantic Ocean and pull Europe and North America together—it is every bit as irresistible as The Swiss Family Robinson. In his beautiful book Invisible Cities, Italo Calvino describes Baucis, an imaginary city that exists in the sky, resting upon slender stilts, and populated by people who never descend to the ground. “There are three hypotheses about the unknown inhabitants of Baucis,” writes Calvino. “That they hate the earth; that they respect it so much they avoid all contact; that they love it as it was before they existed and with spyglasses and telescopes aimed downward they never tire of examining it, leaf by leaf, stone by stone, ant by ant, contemplating with fascination their own absence.” It strikes me as odd that our kids are so anxious to grow up because they desire the freedom from authority they imagine adulthood will bring, while at the same time we grownups crave a return to childhood in order to evade the burden of responsibility that adulthood actually entails. I wonder if there’s some magic day on which we and our children pass each other, they rushing forward in a desire for autonomy, we rushing backward in memory and imagination seeking to escape from it. Our Ranting Hill tree house, though plenty modest in comparison to the one depicted in the old Disney film, seems perfectly exotic to us. It satisfies our basic craving to retreat to a hidden hideaway, one whose stilts lift us up into the trees that we climbed down from so long ago. And while our tree house is only about 250 feet from home, it is beautifully concealed among the juniper—invisible, secret, always ready to become a pirate galleon, a desert island, a lunar module, an eagle’s nest, a soaring hot air balloon, an undiscovered planet—whatever we need it to be. Maybe a sanctuary for a too grownup writer, engaged in a one-man tree sit protest against adulthood. Our tree house provides a place to climb above the weary earth for a moment, if only so we can look back down at that earth and contemplate with fascination our own absence from it.